While having some fun viewing different STO fans’ pictures of their characters and bridge crews on this thread (thanks, Syp! ), I came across an interesting bridge crew picture and commented on it to my better half. I may be biased, but that was the funniest thing I’ve heard all morning. What would your punchline to the joke be? Suggestions in the comments! Have you ever tried…. NOT being a mutant? Why, it was only within my parents’ own lifetime that a couple like my better half and I would not have been able to have gotten married in several US states due to the People With Depression not being able to marry the People Without Depression Act. As it is, we are lucky to live where we do because there are still places where my partner could be assaulted or killed for being openly arthritic. Even at work, I have hidden the fact that I am severely myopic because I am afraid I’d lose my job – I’m not a protected category under anti-discrimination laws. It is especially distressing to think about the places we are not able to freely travel to because a world leader recently declared that there were no people with asthma in his country, because it is illegal to have asthma there. In short, good points! Homosexuality is not “normal” and all differences in the human condition are exactly the same. Star Trek Online’s headstart begins today Friday at 10AM PST, so let’s all get back to gaming and forget that we have differences of opinion again! Edit: I am obviously more bleary-eyed than I thought, as it is clearly Thursday and not Friday. What, did we cure that too? Darren of Common Sense Gamer has a thought-provoking post about the issue of representation in gaming, and rather unlike myself, I actually bothered to comment. I have several other thoughts about the subject, though, so I am posting the overflow here. Darren, and others in his comments, seem to wonder how much representation is enough, for minorities of all shapes and sizes, or rather how much is too much – how can one game represent every type of person in existence, and more importantly, should it be expected to? Is that a responsibility of a game, a noted method of escape and fantasy, to represent every minority, every uncomfortable reality, every frailty of human existence? I can understand the resistance – it seems excessive on the face of it – but with a little consideration I pointed out in my comment that the apparently Herculean task of representing anyone and everyone at all largely comes down to a robust character creator and then a very few additional options if one wants to go down the path of portraying a romance. Furthermore I realized that none of this should have an effect on the story the game is trying to tell at all; unless a character’s ability to reproduce with their partner is paramount to the plot, I’m not sure why Soldier McHet needs to be straight at all. The key word here is option; if you want to be Soldier McHet, I believe it should be possible. I do not believe that the presence of other options should affect any player’s opinion of the game or story at all. Further on the subject of representation, I continue to struggle with my fantasy life versus my real life representations in each new game. On the one hand, I would like to create an idealized character I enjoy looking at while I play. On the other hand, there is no shortage of tall, leggy redheads running about the game world, so why bother, amirite? What I usually end up doing is attempting to create a character that looks more like an idealized me. The reason I usually end up doing so is because I figure, if I don’t, who will? This also has the effect of highlighting the number of game worlds in which someone who looks even remotely like me does not exist. I am a visible minority in my place of residence, the USA. Many games ported from Asia, with their singular skin tones and three hairstyles, are guilty of rendering me non-existent. Sometimes I play them anyway. Sometimes I am just sad. Who wants to not exist? Why would I want to fantasize about an idealized world in which I do not exist? In worlds in which diversity consists of aliens with different physiologies, or magical universes with talking Orcs, or the ability to blow yourself up with fire you summoned from your very own soul, please don’t ask someone to be pleased that they have been “cured away” by magic, by fantasy, by futuristic science and medicine. It’s really not that hard to imagine that we are there, if you try just a little. Trust me. Edit: The Border House has thrown in its two cents. I’m about to unleash a highly controversial and unpopular opinion about Star Trek Online in this blog entry. I’ve debated whether I’m quite ready to put my sanity on the table for questioning, but my feelings are too strong on this matter. I simply can’t contain it any longer. I really, really like ground missions. There. I said it. I’ll make no bones about the fact that I was dubious about the state of ground combat prior to playing the game for myself, and even then I had reservations and requests for improvement. Whether I’ve merely grown accustomed to its handi-cam visuals or Cryptic has actually improved something server-side or some combination or third option entirely, I find myself looking forward to a mission that will require me to beam down to a planet/ship/facility and get some work done. After a careful survey of the other person whose opinion matters to me as much as my own (I swiveled my chair around and asked my better half), the verdict is unanimous. Ground missions are fun. Last night we had the opportunity to put out fires in a research facility with a fire extinguisher, mixed in with tactical combat. We got to spray stuff with foam! We put out every fire in that facility, long after all the enemies were dead and their hostages rescued, just because we could. We probably would have set a few fires if it would have meant we could then spray some more foam at them. Later, after beaming down to a planet, I went into aim mode with my pulse rifle, waded into some water, and found my character strategically taking cover behind a well-placed reed while a Gorn picked up chunks of earth and hurled them in my direction. If I could have paused the mission right then and there to take it all in for a moment, I would have; in fact my only quibble is that combat is so fast-paced that I can never manage to get screenshots of the cool moments. If Cryptic manages to achieve its goals in the latest State of the Game with improving the Genesis System, I may never come back up for air. Instead, I have decided to go with a lovely Orion girl who will cut you. Unfortunately I have not yet had a chance to check out the Klingon side of the fence, as I have been focusing on getting my Federation character to level 11 so that I can try out a Science Vessel and see if it gels with my playstyle. So far I am Lieutenant 7 and counting. I would love to be able to say that it has been a grind getting to this point, but the truth is I have barely been paying attention to my level; the ability to create a Klingon character came as a shock to me. Every day we learn more about the mechanics and depth of the game, while playing longer and longer gaming sessions than we originally planned to indulge in. 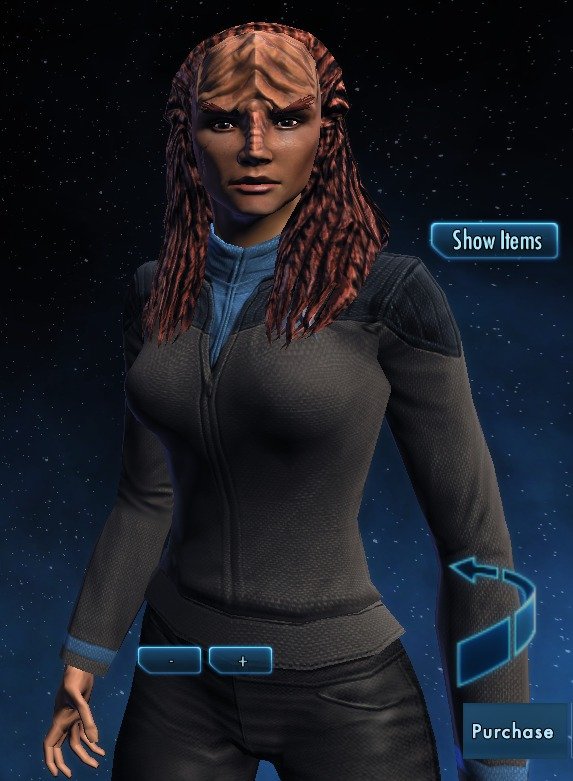 I’m going to miss my Federation character when the open beta ends. I may eat my words at some point, but right now I don’t think I have it in me to roll even one alt in this game. I haven’t felt this connected to a single character since I played in the Fallen Earth closed beta, and That’s A Good Thing. 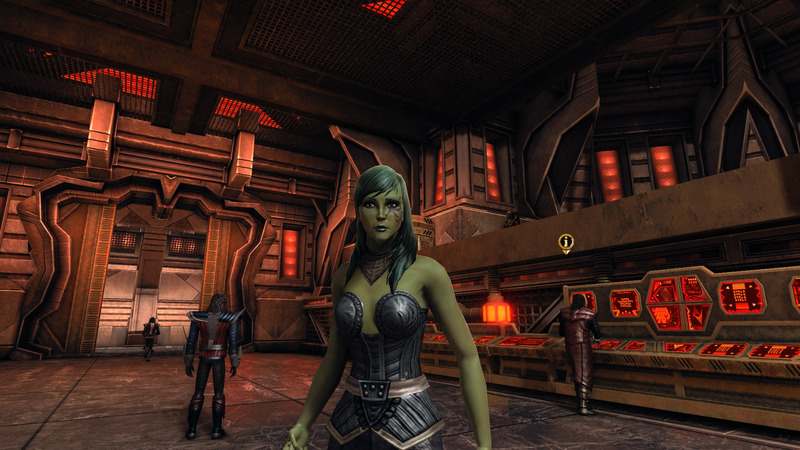 After the server apocalypse that prevented us from being able to play all evening Wednesday, my better half and I managed to get a nice few hours’ worth of STO open beta fix last night, and I’m here to report our kudos and criticisms for the experience. First: Cryptic has finally made a Lifetime Sub for STO available. I don’t trust my judgment on these issues, as I previously considered buying the lifetime sub for Hellgate: London (but didn’t, thank goodness), and I did go so far as to purchase the lifetime sub for LOTRO, which has in no way paid for itself given that I don’t really enjoy the game and my better half despises it. We wrestled for a moment with the thought of taking advantage of the deal for STO (financially viable or not – nearly $500 for two gamers is kind of absurd!) but decided against it. We are leaning more towards buying the year’s subscription instead. We hope to still be playing STO in a year’s time, but with the year sub being the equivalent of only 8 months at the $15/mo rate we are comfortable that we won’t be locked in for an absurdly long time should our interest wane in 6 months or something. People are not happy with the limited character slots that STO is providing (two Federation slots and one Klingon slot, plus another two slots if you take advantage of the exclusive subscription offers), and I’m personally baffled that the slots are going to be so limited as well. On the other hand, speaking for myself, I have little interest in rolling alts right now because the content requires more dedication thus far than other MMOs I have played, and furthermore the customization options and bridge officers are really working hard to quell the need I have to roll up other characters just to see how they’d look. The only thing I feel locked into with STO is my class; I still haven’t decided which I’m going to go with at launch, and that seems like an awfully big decision to not be able to experiment with. It would have been nice if you started as a general-skilled Ensign for the tutorial and first few missions, with all class kits available to you, and then you could choose a specialty a little later. Second: I would like to register my disappointment in what I understand to be the crafting portion of the game. I could easily be mistaken, but if the material crafting based on collecting anomalies merely consists of handing over materials to an NPC to create an item for you, that sounds almost exactly like Guild Wars. Unlike my view on most features of Guild Wars, I’ve come to quite like crafting in other games and I was hoping to have a little nook on a station somewhere where I could fit together items and invent things. To be fair, I’m not sure how well that kind of thing would fit into the Star Trek universe; sure, Geordi might have jury-rigged a few items in his day, but I wouldn’t say it was a full side profession for him. So I simply note my disappointment and move on. Third: We got to sample the Genesis System for the first time last night, to mixed results. I’m really unhappy with the inability (bug?) to tackle an anomaly as a group, or to come to my group member’s aid in his own existing mission. Several of the anomalies we investigated spawned bugged missions, usually in the form of directives to locate items that did not seem to exist, or that did not spawn in enough numbers to complete the mission. I would give an arm for the ability to scan a system and have it mark spawn locations on the map for me once I was within a certain range (say 20km) rather than flying up and down the map hoping to glimpse something I might need. Now I have to choose my next course of action for our upcoming weekend gaming marathon. The gamer in me wants to avoid the Genesis system now, because I didn’t sign up with my partner only to play this game together alone, and because the bugs made the overall experience pretty frustrating. The beta tester in me wants to spend more time with Genesis in order to provide bug reports and feedback so that we can get to the point that we do want to play around with it more. I regret that I was not as rigorous in bug-reporting as I could have been last night, since at first I wasn’t even sure what to expect or how things were supposed to work. I hope to have some good feedback for the Cryptic team this weekend. All bugs and issues aside, we still ended up gaming longer than we’d planned last night, under the guise of “I just want to finish this one thing/I just want to try this other thing….” so I feel the game must be doing something right.